Lavender Sky: Orange You Lovely! 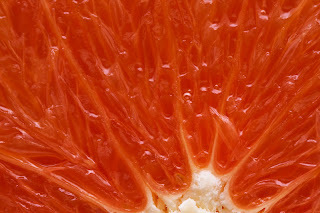 Cara Cara oranges. Wow! I picked some up at the grocery store thinking, "These look nice, and it's the perfect time of year for citrus." Never having had them before, I didn't expect the inside to be reddish pink. Research availed that they are also known as pink navels, originating in Venezuela. They are less sweet, and less acidic, making them perfect for savory applications. I immediately thought these were the types of oranges chefs had in mind for duck a l'orange. Possibly a salad of warm duck confit, frisee and cubes of cara cara oranges, with a sherry vinaigrette. Or, supremes layered between tuna sashimi with ginger poached orange peel. In my next culinary life I might want to be a sushi chef.